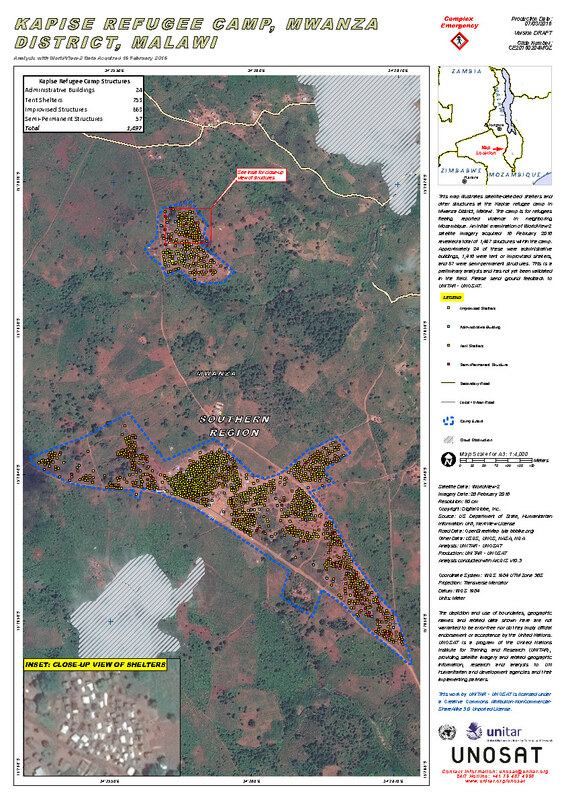 This map illustrates satellite-detected shelters and other structures at the Kapise refugee camp in Mwanza District, Malawi. The camp is for refugees fleeing reported violence in neighboring Mozambique. An initial examination of WorldView-2 satellite imagery acquired 21 January 2016 indicated 619 shelters while the latest imagery from 16 February 2016 revealed a total of 1,497 structures within the camp amounting to 141.84% increase in shelters. The latest image indicates that, of the 1,497 shelters, approximately 24 of these were administrative buildings, 1,416 were tent or improvised shelters, and 57 were semi-permanent structures. This is a preliminary analysis and has not yet been validated in the field. Please send ground feedback to UNITAR - UNOSAT.